So, before I starting writing this post, I thought I'd do a quick google (friends and colleagues have grown to appreciate I google everything!). So, this post is about "Barry's jewel in the crown". Well, that's tickled me. The Knap is a really nice part of Barry, and yes, that's reflected somewhat in the house prices (whilst googling I have found a gorgeous house with a swimming pool nearby- one day!). 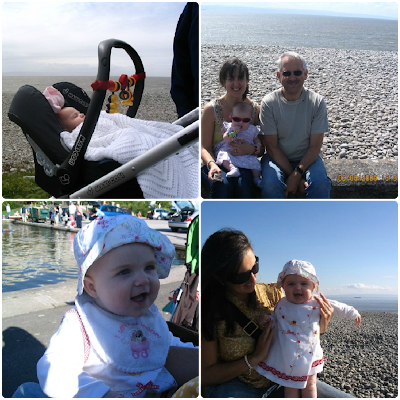 I actually can't remember going to the Knap much as a child, and as I grew up it was more the place people went 'for a walk', and that wasn't really my cup of tea. So, what of the Knap now. Firstly, it has free car parking. And if you're parking near the beach it has public toilets and showers. Next, it has some really good coffee shops, and one does The best cake. It is perfect for taking your daughter for a coffee with grandma. And then going for a walk. 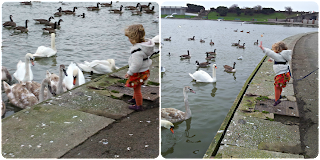 There's a gorgeous lake, with lots of ducks to feed, and Swans to watch flying. There's a great skate park... for a day in the future. And if you've got time, you can walk along the promenade, and bring bikes or scooters for little ones first lessons. 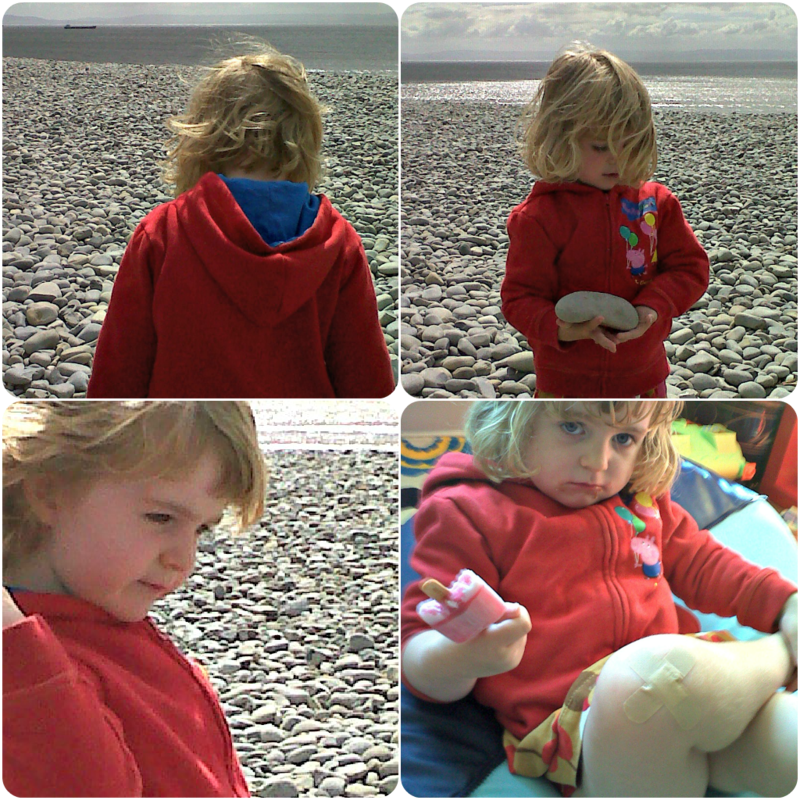 We only had time for the coffee, the walk through the park, and then some time spent on the rocky beach throwing pebbles. It was great to take a couple of hours out of the day to enjoy some fresh air, relax and forget about the mundane. With comedy value for me that Squeak's war wound is nothing to do with the pebble beach but from tripping over nothing in the car park. And when offered plasters at home, she asked for two, so she could "make an aeroplane" with them. And because these are the only photos I've managed to get off my silly phone, I've found some of the lake from January. Oddly, she's wearing the same dress. But even so, she seems to have grown up such a lot. I digress. But it has made me remember some other photos... in fact the Knap was the first beach Squeaks visited... oh yes, a chance to pull out some baby photos! And back to the Lake in January. The Knap is a fantastic place for getting rid of excess energy, getting some fresh air. Eating great cake and ice-cream. In years to come, it will be a place for scooters, roller skates, bikes. 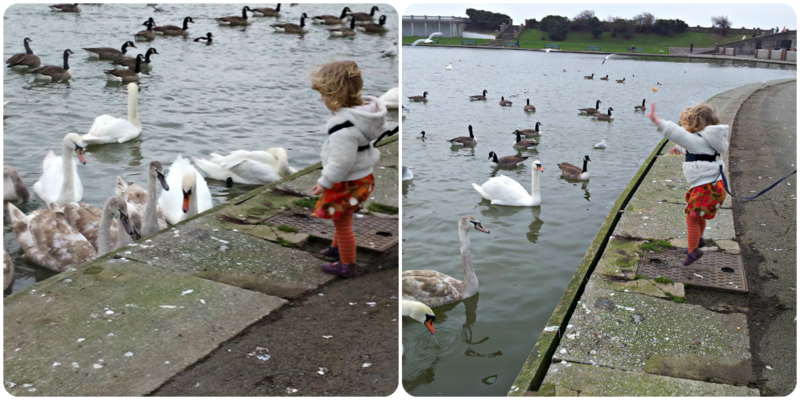 For now, it is for feeding the ducks and throwing pebbles. Thanks for a lovely link up. She has changed so much in such a short time, funny to see the same dress has grown with her though! Think we are heading to the beach now, very last day of the holidays and sunny, has to be done!